The French photographer Henri Cartier-Bresson defined the field of photojournalism and created some of the most memorable photos of the greatest world events of his era. He also brilliantly captured "the decisive moment", the split second when an intersting and powerful composition is best photographed. David Seymour was a Hungarian photojournalist. 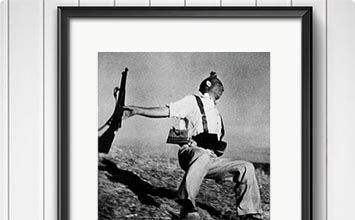 Seymour put himself in the line of fire by documenting the Spanish Civil War, World War II, and then collaborated with UNICEF on a project to illustrate the effects of the Second World War on children. He also was a cofounder of Magnum Photos, the first cooperative agency for international photographers, along with Robert Capa and Henri-Carter Bresson. Koudelka is a Czech-born French itinerant photographer known for his depictions of gypsies and the 1968 Soviet invasion of Czechoslovakia. "Photography for me is not looking, it's feeling. If you can't feel what you're looking at, then you're never going to get others to feel anything when they look at your pictures." Though one might be forgiven for sometimes confusing it with Documentary and Street Photography, Photojournalism possesses a vitality and a force all of its own. At its most rudimentary, Photojournalism is the practice of conveying the urgency of current news stories through pictures. It is true that a photojournalistic image can sometimes be left to speak for itself, but more usually it develops a narrative in conjunction with a written text; a comingling, in other words, of photography and journalism. Photojournalism is the lifeblood of the daily press, but it is associated predominantly with the rise of dedicated photo magazines, the Sunday Supplement, and their preference for the so-called photo-essay. Photojournalism deals with important, or newsworthy, subject matter, and its two overarching themes are world events and social injustice. Given, moreover, that photojournalists are usually committed to exposing wrongs, photojournalism is predicated on an unwritten code of practice that states that - if it is to adhere to the very highest standards of journalistic objectivity - the image must not be staged or manipulated. These rules are easier to apply to live action photography, however, and in actual practice the codes of practice can be bent where the urgency of the situation has demanded it. And while photojournalistic images tend to be very much "of the moment," Photojournalism has become instrumental in how we have come to view the last 170 years of world history. At basis, Photojournalism performs an important civic duty. Based on the premise that one always trusts the evidence of one's own eyes, it is Photojournalism's job to inform the public by showing the world "how it is in reality." The image, therefore, confirms the content of any accompanying written text (or vice-versa indeed). It is true that some exceptional photojournalists have achieved the status of "artists" - Henri Cartier-Bresson, Dorothea Lange and Arthur Rothstein for instance - but typically Photojournalism does not sit comfortably within the sphere of modern art photography. Photojournalists are more likely to earn the respect of their peers and the public as intrepid buccaneers willing to put their own safety at risk in order to capture the truest images. Since they can both aim at exposing social and/or humanitarian injustices, Photojournalism can certainly qualify as Documentary Photography. But unlike documentary, photojournalism tends to be investigative and unrehearsed. Photojournalism relies very much on an opportunistic snapshot principle for its effect whereas Documentary Photography is more typically the result of planning and considered composition. The photojournalist seeks to capture a moment - or a split second (the "decisive moment" as Henri Cartier-Bresson called it) - that would have, without their daring and endeavour, gone unnoticed. There is then sometimes a guerrilla element to photojournalism, especially so where the photojournalist is operating incognito or within a war zone. The first cameras were seen as little more than machines for documenting reality. Early pioneers such as Louis-Jacques-Mandé Daguerre and Henry Fox-Talbot used their cameras to either produce studio portraits or to photograph public spaces and landmarks and the realization that photography could be used to inform the public emerged soon thereafter. The first true Photojournalism, however, is usually attributed to Carol Szathmari and Roger Fenton who used their cameras to document the Crimean War (1853-56). Szathmari, a Romanian painter, became a war photographer when, on his own initiative, he outfitted a wagon with a dark room and headed first to the banks of the Danube River, and onward then, to other Crimean battlefields. He exhibited approximately 200 war photographs at the 1855 Paris World Exhibition to great acclaim and was subsequently appointed Court Painter and Photographer for Romania in 1863. First published on 25 Mar 2019. Updated and modified regularly.